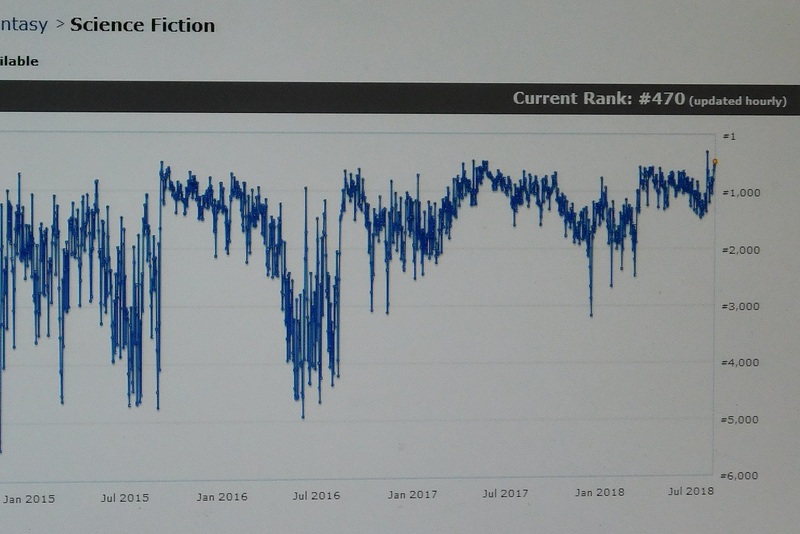 Three and a half years of my Author Rank in Science Fiction. It’s pretty obvious when I am publishing in quick sequence, and when there a long stretch of nothing. At least the dips are getting higher, and not crashing back to the bottom anymore. maybe we could get Peter to post his, just for the period covering the release of those three books? Do Amazon’s terms prevent you from running that through a Fast Fourier Transform? ‘Cause I’m having flashbacks to when I was reading about some digital signals processing stuff. Naw, just do a Laplace Transform, and then some Bode plots…. Pam, thanks for that graph. There’s a clear audience build there. I’m now a bit more hopeful of release results. I’m also changing my cover plans. It looks like it would be worth sinking a bit of time in a 3D model, and using it as a theme for the books. Another thing to keep in mind, September 2015 is when KULL started. It coincided with a four title push of mine. Since I fell back into the slush the following summer, it’s hard to say whether my push would have managed that all by itself. Thanks for posting this. Interesting when added to Peter’s post. Stuff to consider. Thanks. KULL would be short for Kindle Unlimited something something? KULL = Kindle Unlimited Lending Library.